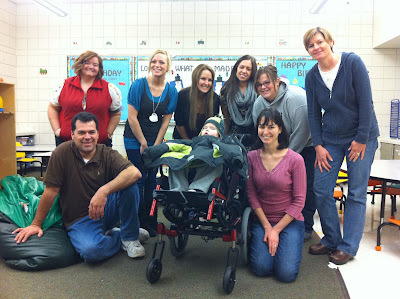 Bertrand fell asleep so he wouldn't have to say goodbye to his wonderful teacher and aides. Today was Bertrand's last day at the Carmen B. Pingree Center for Children with Autism. We are going to miss Pingree so much! The staff, facilities, and kids there are fantastic. In the future, we'll be stopping by for old times' sake, conferences and different events. 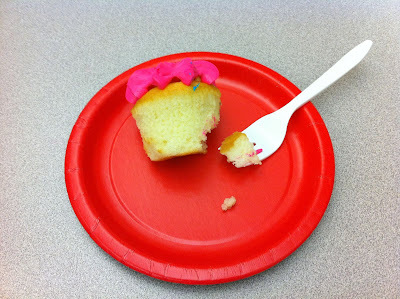 Mama let Bertrand eat a few bites of his "farewell" cupcake at the class party. "Some people only know one way of giving - with both hands, with all their hearts, without a second thought. Thank you for being those people." These were the first people I felt safe sending my most precious baby to. Any child in their care is fortunate to be with them. Bertrand's classmates made him a thoughtful farewell card. 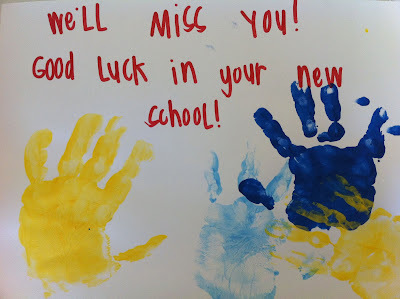 We'll miss you too, Room 1137!